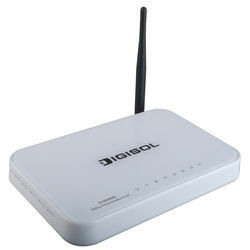 DIGISOL DG-BR4000N/E 150Mbps wireless broadband router enables communication between wired and wireless notebooks/desktop computers in the network; and it also allows Internet connectivity to the network. This router has 4 Ethernet LAN ports and 1 Ethernet WAN port for connection to LAN and Internet respectively. The DG-BR4000N/E has one fixed antenna and can provide wireless data transmission rate up to 150Mbps which enhances the sharing of files, photo, audio, video and gaming experience over wireless network. DG-BR4000N/E is truly a high performance and cost-effective solution for your home and small business environments.